Looking to save money on car repairs? Try doing it yourself. A simple search of "car repairs on YouTube will bring up hundreds of tutorials. Patrick Chambers, of Corinth, said he has fixed up his vehicles for years with the help of YouTube. "I replaced my own brakes," he said. "It would normally be a $2,000 job. I spent just $700 on parts." 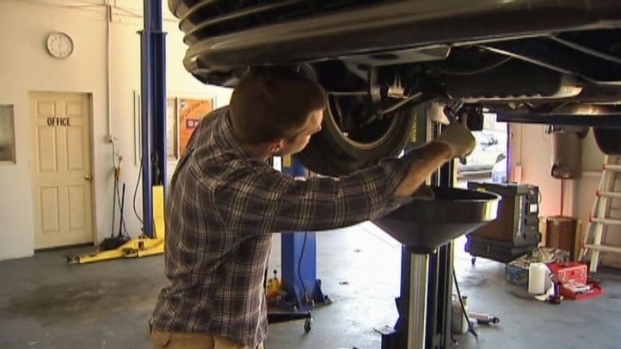 YouTube is helping some do-it-yourself-ers save thousands of dollars with car repairs. Chambers is an experienced do-it-yourself-er, but he also encourages first-timers to give it a try. "I have saved thousands of dollars," he said. He's watched hundreds of videos applicable to various repair jobs. MyBay Automotive in Denton rents repair bays and equipment to car owners who want to repair their own vehicles. "They're pretty generic," he said. "They take one car and tell you what you can look for in other cars." Chambers is a fan of the website EricTheCarGuy. "His website also ties into his YouTube videos, so not only can I search his website for his forum info but also his videos," he said. Chambers used online information on an Acura to change the gear shift in his Volvo XC90 sport utility vehicle. Rather than buying the part at a local dealer, he also saved money ordering the Volvo gear shift online. "The part cost $131, and the dealer quoted me $212," he said. It took Chambers about 45 minutes to get his Volvo gear shift changed. "I easily have saved $400 to $500 on this repair doing it myself," he said. David Hettena is another repair enthusiast and YouTube fan. "YouTube is great, because unlike looking at pictures in a book, you can actually see how someone takes something apart," he said. He did his own step-by-step oil change on his 1990 Lexus at MyBay Automotive. Customers can rent lifts for their cars at the Denton do-it-yourself shop. "I can save a tremendous amount of money," said Hettena, who has been doing his own repairs for years. "Instead of paying ... $100 for full synthetic oil, I can get it done for $40 or $30. Air filter changes cost me $5 in five minutes." Hettena also uses online car forums, which can be found by Googling for a car's make and model. He found the step-by-step instructions for his Lexus' oil change by doing that. "It can really make you an expert just by doing a little bit of research," he said. Jessica Konderla had never watched a YouTube tutorial on car repairs but was willing to give it a try. "It doesn't seem that difficult," said Konderla, whose father is a mechanic and the shop manager at Rick and Ray's Auto Plaza in Fort Worth. With her dad sitting next to her, she watched a YouTube video on how to change a car battery and successfully replaced her corroded battery with a new one. But changing her headlight bulb after watching a how-to video wasn't nearly as easy. "It was harder than it looked, definitely," said Konderla, who didn't get that job done. "I like the experiment," said her father, Ray Konderla. "But it showed [that] sometimes, it looks easier than it turns out to be." He said many jobs are simply too tough for people to watch a video on and then perform on their own car. Ray Konderla said he has clients who watch YouTube to learn how to do their own car repairs. "One of my friends fixed his own brake rotors," he said. "Of course, I was upset, because he didn't bring it to me, but it saved him some money." But even shops will reference videos when they get a repair problem they've never seen before. "The videos can be a great guide," he said.